Style, manners and taste never go out of fashion. The best thing I love about blogging and styling is, collaborating with other creative beings like myself. In collaboration, I had the pleasure to experience the Beckemberg cricket club where I received grooming and a couple of pieces from Dreu Beckemberg's collection. He is an effortless talent and provides some of the best services to his prestigious clients. From Grooming, to alteration and custom clothing. Instead of running around place to place join the Beckemberg cricket club where everything is provide at once. This is a outfit that is guaranteed to get you noticed where ever you go. 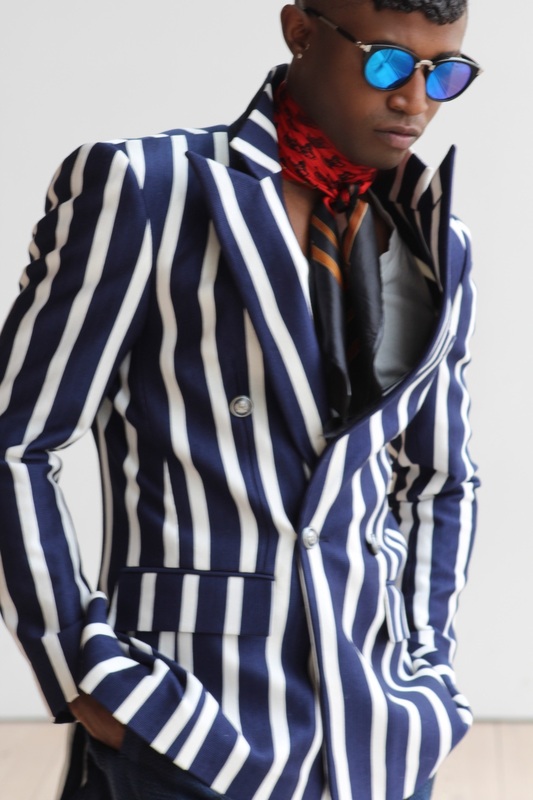 For this look, I combined a modern white and blue stripe double breasted blazer with a short sleeve V-neck and sweater stripe pants to make the look versatile. I can go from formal to casual just by removing the blazer from this look. To top the look off, I Accessorized with a vintage scarf, mirror sunglasses, and black leather derby shoes for a killer transformer look.